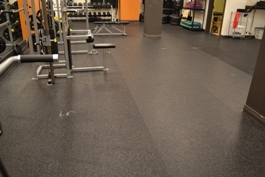 ProXL has a low life cycle cost and signature look, making it an excellent choice for weight room applications. Engineered to withstand heavy weights and cardio equipment. G•Court consists of a vinyl top surface material which has a unique closed cell expanded vinyl foam underlayment. Its built-in multi-layer foam structure does not require expensive underlayments, and its unique design minimizes the risk of injury without sacrificing performance. G•Court features an abrasion-resistant wear layer and helps to lower maintenance costs because it never needs sanding or refinishing, and scuff marks remove easily from the permanent polyurethane varnish. It is extremely hygienic: non-porous surface has bactericidal and fungicidal treatment. G•Court is an outstanding solution for multi-purpose rooms or anti-fatigue retail needs.